Sam Boghosian is a former American football player and coach. 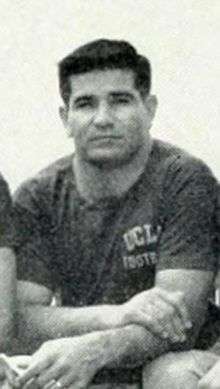 Boghosian played Guard for coach Red Sanders at UCLA from 1952-1954. He was a member of the Bruins team that won the 1954 Rose Bowl and was named that year's FWAA & UPI National Champions. Boghosian became a member of Russell's coaching staff in 1957 and remained there until 1965 when he joined fellow UCLA assistant Tommy Prothro at Oregon State. Boghosian remained at OSU until 1975 when he joined the Houston Oilers coaching staff. In 1965, Boghosian was interviewed for the Oklahoma Sooners head coaching job, but the university hired Jim Mackenzie instead. From 1979-1987, Boghosian was the offensive line coach for the Los Angeles Raiders. He would help coach the Raiders to two Super Bowls (XV, XVIII). Boghosian was offered the Oregon State head coaching job in 1984, but turned it down. The Raiders fell to 5-10 in 1987 and Boghosian was one of five assistants let go by the team. Boghosian was inducted into the UCLA Athletic Hall of Fame in 1999.